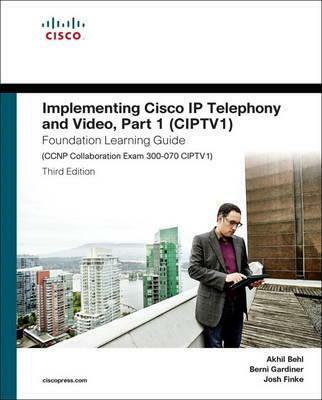 Now fully updated for Cisco s new CIPTV1 300-070 exam Implementing Cisco IP Telephony and Video, Part 1(CIPTV1) Foundation Learning Guide is your Cisco(r) authorized learning tool for CCNP(r) Collaboration preparation. Part of the Cisco Press Foundation Learning Series, it teaches essential knowledge and skills for building and maintaining a robust and scalable Cisco Collaboration solution. The authors focus on deploying the Cisco Unified Communications Manager (CUCM), CUCM features, CUCM based call routing, Cisco IOS Voice Gateways, Cisco Unified Border Element (CUBE), and Quality of Service (QoS). Covers CUCM architecture, deployment models, and tradeoffs Walks through bringing CUCM online, deploying endpoints, and setting up users Explains how to create a solid IP Phone foundation for advanced services Covers dial plan elements, design, and implementation Reviews key call routing elements Explains digit manipulation Shows how to control user access Discusses audio/video resources and videoconferencing Covers QoS tools and preferential call handling Explains external connections via Cisco IOS Voice Gateways and CUBE Streamlines review with clear summaries, assessment questions, and objectives "